Miss R: Mummy, can I marry Miss L when we grow up? Me: No sweetie. You can't marry your sister. Miss R looked somewhat upset. Me: Why do you want to marry Miss L? Miss R: So we could always live together. If I can't marry her we will have to marry someone else and we won't be able to live together then. I will miss her so much! These two melt my heart every single day. They seek each other out as soon as they wake up. They are each other's shadow. OK, usually. There are times when they need a little time apart, but only after a few minutes they are back together enjoying each other's company. 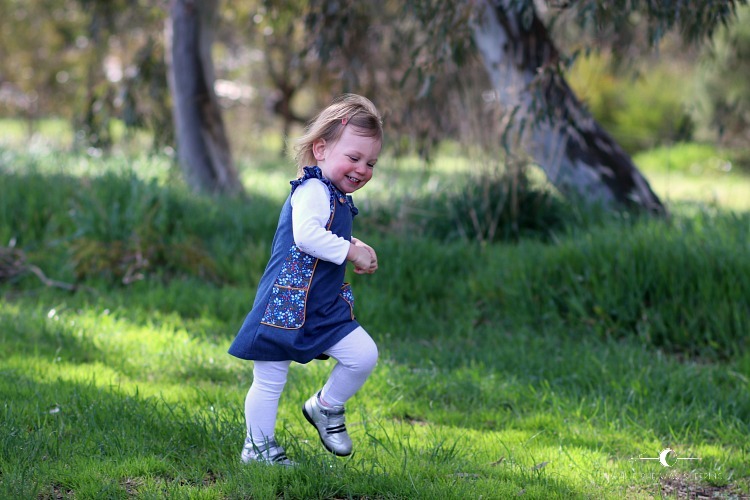 It is expected that the younger sibling would be copying their big brothers or sisters. I did not think that the same would work in reverse! Miss L (the little one) favours blue and red. Last year I bought a remnant of Soft Cactus cotton from MaaiDesign. It was always meant for Miss L. Miss R quite loudly declared that she didn't like it. I decided to use this print for the side panels for the Cosmo dress for my little love. The only fabric from my stash it matched perfectly was lightweight denim I bought to make a dress for myself. 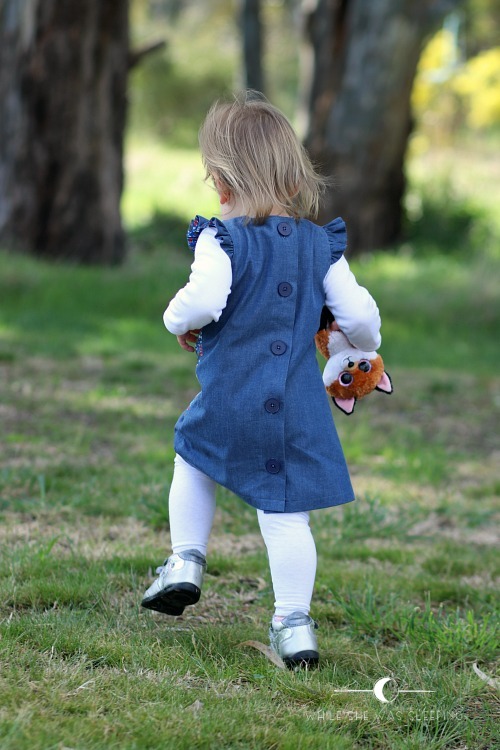 I am a loving sewing mummy, so I decided to sacrifice it for my little girlie. I had the perfect shade of homespun cotton to make piping. 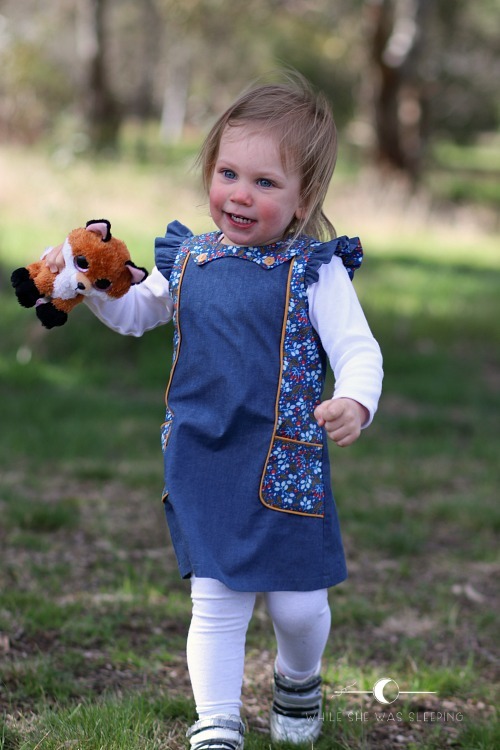 The Cosmo dress pattern has a few views. 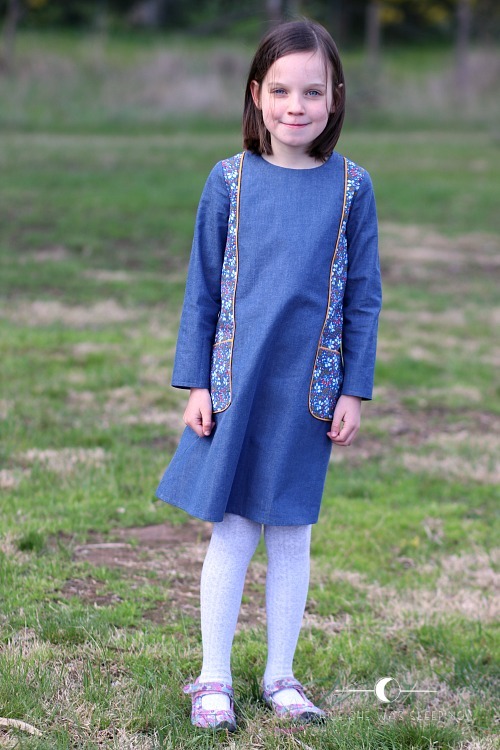 My big girlie wanted a long sleeved dress she could wear now while it is still cold. So that is exactly what I made for her. This dress is size 6 with size 7 length. I am super happy with the fit. 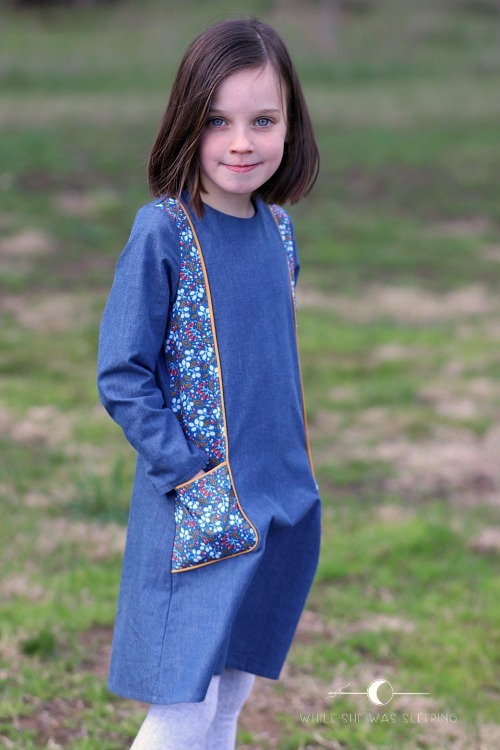 These glorious pockets are the main feature of the pattern, but one cannot rush sewing them. Suz talks you through every single step in great detail, so please do not feel intimidated. 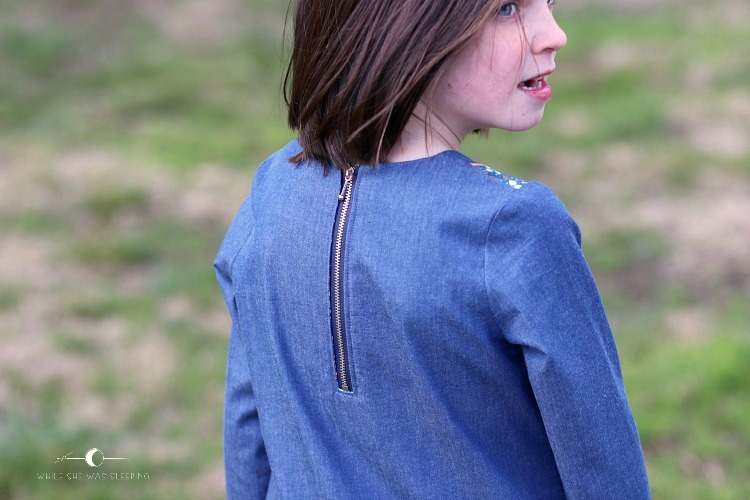 Another great feature of the dress is the exposed zipper at the back. I love the way it is installed. If you have not done this before, don't fret. Suz put together a video tutorial to help you out. And one more neat detail - the pattern includes a zipper guard piece. For the first time in forever I didn't have to make it up myself. 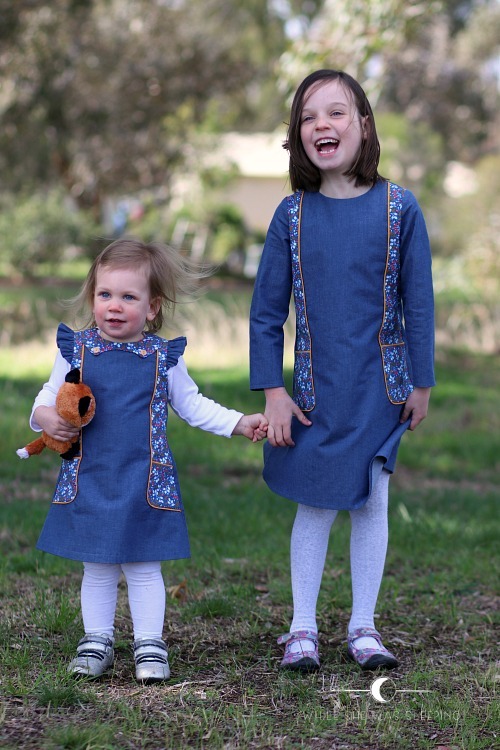 While I was excited by the idea of making matching dresses for my girlies, I didn't want them to mirror each other. Besides, I wanted to try another view of this pattern. 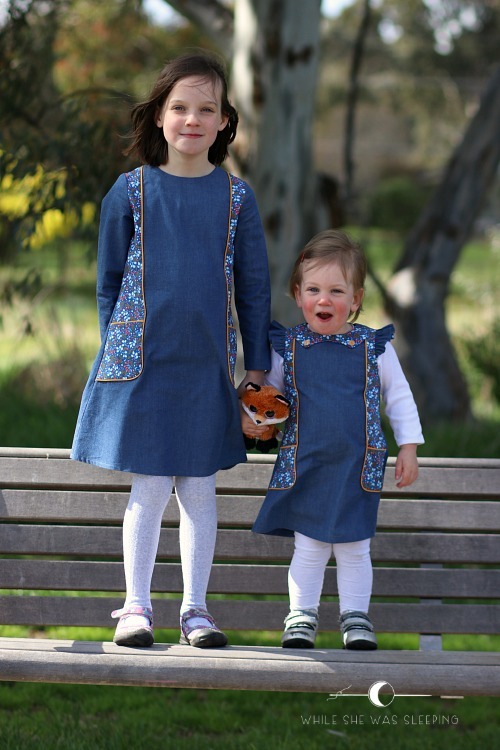 For Miss L I chose a view with flutter sleeves and a sailor collar. I did consider using collar pieces from Suz's Tic Tac Toe dress, but the shape of the sailor collar looked so original I decided to go with it. The dress has no lining, instead Siz offers facings for the neckline and the arm openings. I must admit I was a little worried the facings might peep out. I understitched them, and so far so good! Now, while I think that exposed zippers are funkier than invisible ones, nothing beats buttons in the fun department! So, naturally, I created a button placket. I was originally hoping to use mustard of orange buttons to compliment the colours of the Soft Cactus print, but I only had four of them. The story of my life! I did however had a small stash of blue buttons that seemed to go with the denim well, so I used them instead. 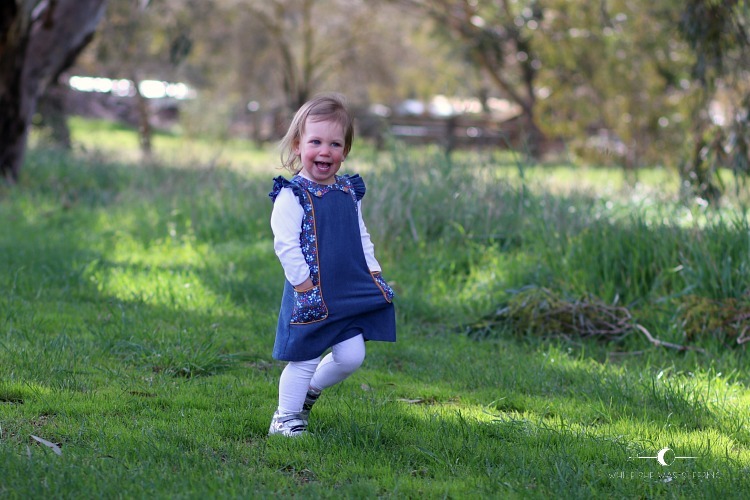 Miss L didn't comment much on her new dress, other than exclaiming, 'Dress! Pockets!' She happily wore it a few times already. What are my chances she will be so easy to please forever? 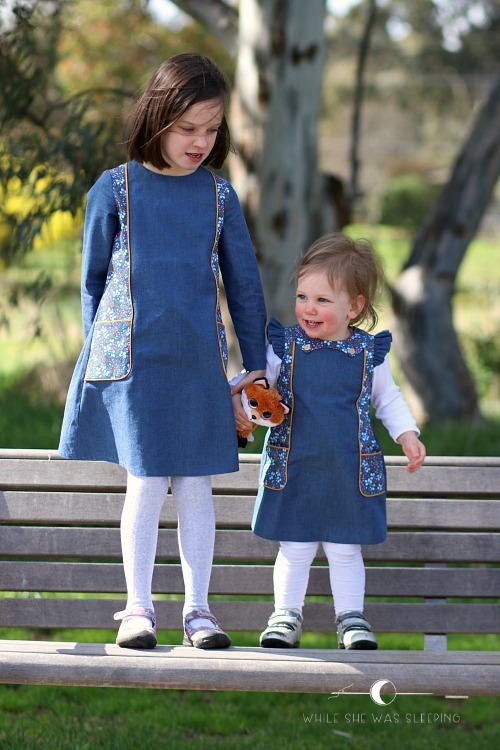 I am very pleased with Suz's new pattern, and love the matching Cosmo dresses on my girlies. 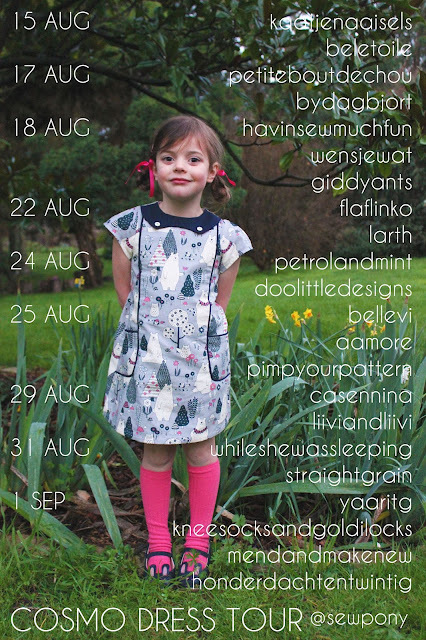 Are you keen to make a Cosmo dress as well? 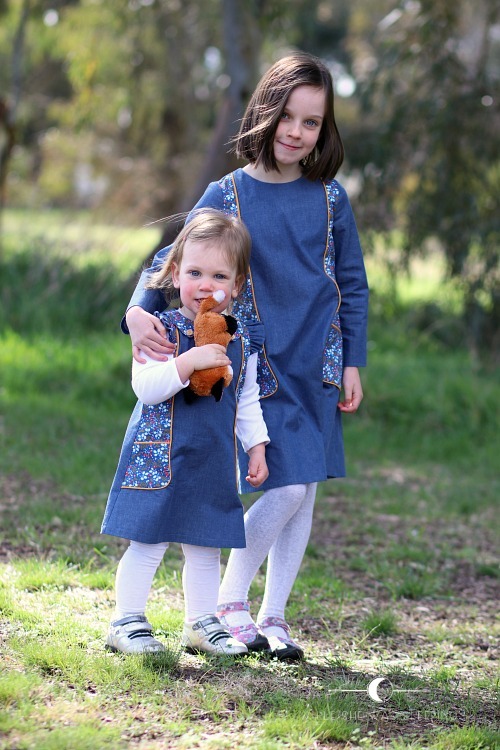 Suz is offering a 15% discount on the Cosmo dress pattern with the code COSMOTOUR that you can apply at checkout until the 2nd of September 11 am AEST. 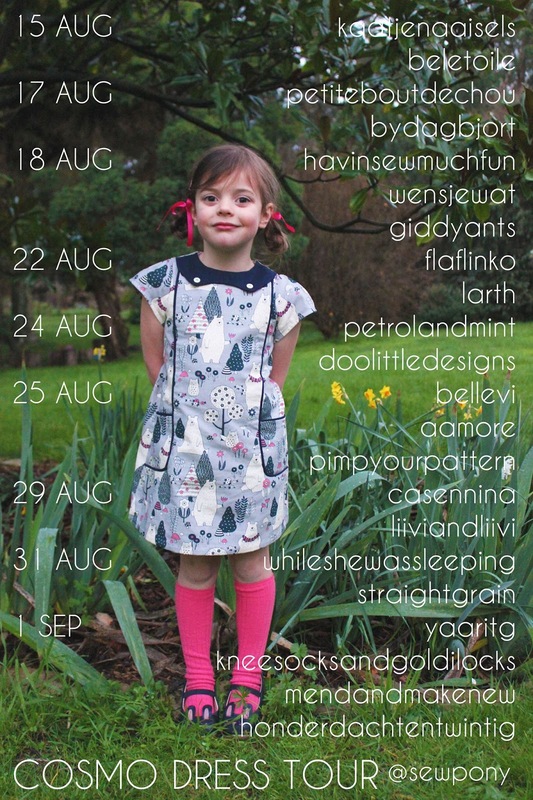 I might mention that the pattern is available in English and Dutch. There is also a fun give-away which you can read about on Siz's blog. And please visit my tour buddies for more inspiration! Awwww your two girlies melt my heart, too!! That conversation at the start... <3 <3 <3 I love both of these dresses so much, and they match in the best way! I can totally understand why you made your fabric sacrifice - so worth it when the result is this beautiful! hehehe twinning is winning, right? Lucky lucky girls to have each other and such a talented sweet Mom. Thank you Mie! Man, at times I struggle to imagine fabric as a garment, too! Thank you Shell :) I hope they will keep their love for each other despite their differences and all. 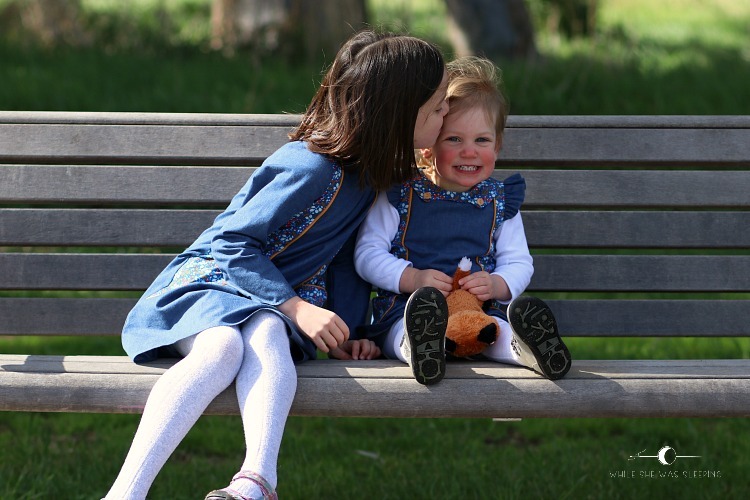 I am hoping to be able to squeeze a couple more twinning outfits before my big girlie decides they are no longer cool!